Abstract: Mayaro fever is an emerging acute viral disease endemic in Central and South America. Mayaro virus (MAYV) is classified in the Semliki Forest virus antigenic complex and shares similarities with the alphavirus Chikungunya virus and the flavivirus Dengue virus. MAYV is an arbovirus transmitted by Haemagogus janthinomys, with competence also demonstrated in Aedes aegypti, Aedes scapularis, and Anopheles quadrimaculatus. Outbreaks and small epidemics of Mayaro fever have occurred in several countries in northern South America and the Caribbean. In addition, travel-associated cases have been reported in European nationals returning from endemic areas. Clinical features of Mayaro fever include fever, chills, persistent arthralgia, retro-orbital pain, maculopapular rash, itching, dizziness, and, rarely, lymphadenopathy. Methods of control for MAYV are similar to those used for other sylvatic arboviruses. Although MAYV was discovered as long ago as the 1950s and continues to be prevalent in the tropical areas of the Americas, it remains neglected and under-studied. This paper provides a thorough and current review of the published MAYV literature ranging from its original description to modern outbreaks, and from the basic virus characteristics to the clinical and epidemiological aspects of this disease. Although the number of reported Mayaro fever cases and outbreaks is low compared to other arboviruses, it is possible that considerable misdiagnosis and underreporting might lead to inaccurate estimates of Mayaro’s public health burden. Accurate diagnosis of Mayaro fever may be complicated by its clinical similarity to other endemic arboviruses such as eastern equine encephalitis virus, Chikungunya virus, Dengue virus, Oropuche virus, yellow fever virus, and Zika virus.5,11–15 In addition, co-infection with Dengue virus has previously been described.15 Moreover, immune cross-reactivity with either other Semliki complex viruses in hemagglutinin inhibition and complement fixation assays16 or other alphaviruses such as Chikungunya virus in antibody assays (i.e. enzyme-linked immunosorbent assays [ELISAs]) 17 may pose a diagnostic challenge. Although MAYV was discovered in the tropical areas of the Americas in the 1950s,5 it remains neglected and under-studied. In addition, owing to the relatively poorly understood nature of MAYV, there is a need to conduct more in-depth research and to employ proven control methods that have worked for other arboviruses to prevent epidemics of MAYV. As mentioned earlier, MAYV has been geographically restricted to Central and South America, with a few cases occurring in the Caribbean. Infrequent outbreaks have occurred in Trinidad,25 Brazil,28,29 Ecuador,7 and Venezuela.31 In addition, sporadic cases have been identified in Bolivia,44 Haiti,15 Mexico,18 and Peru.45 Finally, a few reports of import/export events exist; these have been summarized in the Epidemiology section. 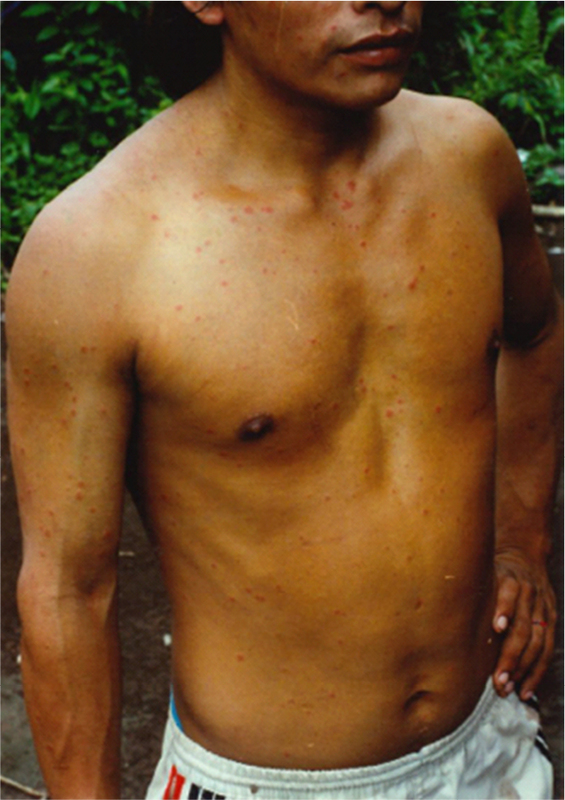 Figure 1 First laboratory-confirmed case of Mayaro disease in Ecuador. Note: This patient is a native of Montalvo, a community in the Amazonian basin located in Pastaza province. 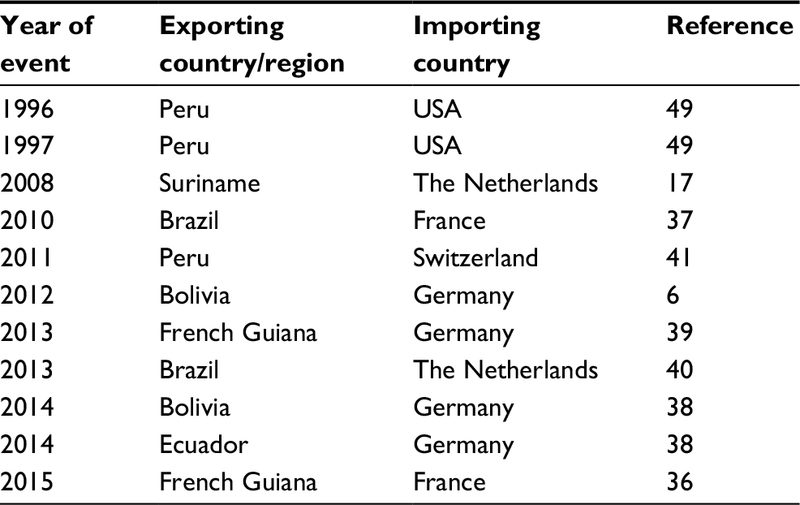 As mentioned earlier, Mayaro fever outbreaks have been reported most commonly in northern South America and in the Caribbean (Figure 2), in addition to sporadic cases reported in Mexico and the handful of import/export events reported in the literature (Table 1). In these regions, Mayaro fever has been found to be common in people living in rural areas in close proximity to the forest, especially around the Amazon river basin.49 In addition, MAYV may be able to emerge in urban areas, as demonstrated by its ability to be transmitted by Ae. aegypti in a laboratory setting.9,10 Should MAYV emerge in urban environments, this would present a significant threat to public health.5 Since MAYV is endemic in areas of the world where Dengue and/or yellow fever virus circulate, and Dengue often produces large-scale urban epidemics, this may lead clinicians to suspect Dengue instead of MAYV fever, possibly contributing to misdiagnosis. Moreover, co-infection and immune cross-reactivity (as discussed in the section “An emerging threat to public health in the Americas”), may also contribute to misdiagnosis and underreporting of MAYV, leading to Mayaro fever’s true public health impact being misestimated. Figure 2 Geographical distribution of Mayaro virus outbreaks. The transmission cycle of MAYV is complex. Although the main mosquito vector for MAYV has been identified (i.e. Haemagogus spp. ),52 some studies suggest that Ae. aegypti,9,10,52 an important urban vector, would be able to transmit the virus. Additional studies exploring the competence of other mosquito species to transmit the virus are needed. Similarly, since other arboviruses (specifically flaviviruses) have demonstrated the ability to persist in bodily fluids and transmit sexually,53 future studies should investigate other possible routes of transmission for MAYV, along with persistence in bodily fluids, especially synovial liquid. With extensive future studies examining key factors in MAYV infection, we may have a unique opportunity to intervene before this emerging virus becomes a more serious threat to public health. The presence of antibodies against MAYV in humans provides epidemiological evidence of its transmission in the Americas. An investigation in Valença, Bahia, in the coastal area of Brazil, reported that only one subject (who had a previous residence of 3 years in the Amazonian rainforest) among 288 sampled individuals had antibodies against Mayaro.54 This subject reported that during his residence in the Amazonian rainforest, he had developed a febrile disease with exanthema and arthralgias.54 Serological surveys of other populations in northern South America have found antibodies against MAYV in rates that range from 1% to 60%.44,55 A study carried out in Belterra, Brazil, between 1977 and 1978 showed that 10.3% of the 161 people tested had antibodies against MAYV. No sampling frame was described in selecting subjects for study. In a parallel study conducted by the same team in 1978, during the peak of the MAYV outbreak, 327 people were tested. The sample represented all ages of susceptible people and all residential areas. Seventy-one (22%) were found to have MAYV antibodies.56 During the Belterra outbreak, five fatal cases and one non-fatal case of yellow fever were reported between January and April 1978. In the parallel seroepidemiological survey, 11 people (3.3%) had antibodies against yellow fever. Four of these 11 subjects (36%) reported having had an acute febrile episode during the preceding 2 months.56 Thus, in the subsequent study, the prevalence of MAYV exposure rose to 30% in the autochthonous population. One observation of this study, which is similar to the findings of the 1954 study in Trinidad and Tobago,24 is the strong association of MAYV and yellow fever virus. This finding, in addition to the fact that yellow fever, similarly to MAYV, is associated with Haemagogus spp. mosquitoes57 and Alouatta spp. monkeys,57 supports the assumption that these diseases have similar transmission cycles in the rainforest. The main mosquito vector for MAYV in its sylvatic cycle of transmission has been identified as Haemagogus janthinomys.5,8 Along with Ae. aegypti, H. janthinomys has also been identified as a vector for yellow fever virus.48 Because MAYV is still emerging and is likely to develop into a more significant public health concern, it is important to identify other species of mosquito that may also transmit the virus. 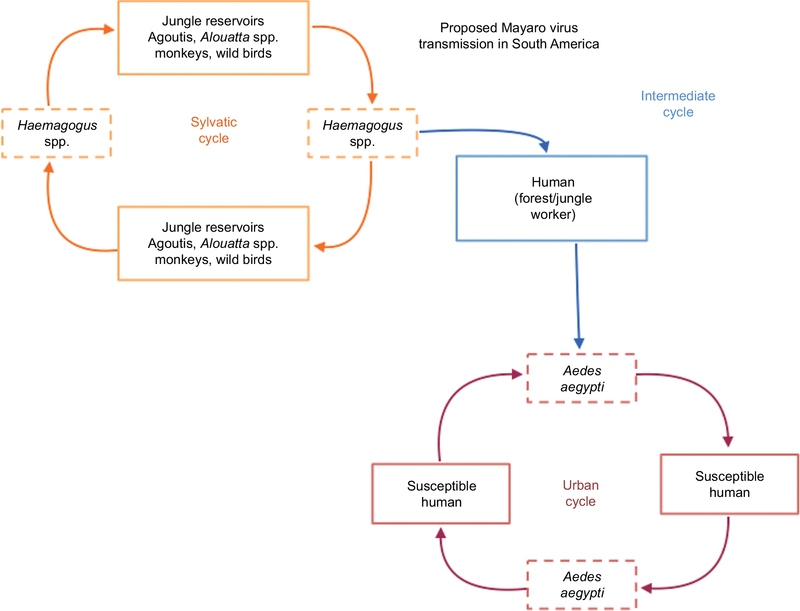 Based on all these observations, we propose a potential three-cycle transmission dynamic for MAYV, similar to the one observed for Dengue and yellow fever, whereby the virus is transmitted in the jungle by Haemagogus spp. in a sylvatic cycle which may then reach urban areas through people living in urban or periurban areas and working in or visiting the forest fringe (intermediate cycle); once in the urban setting, the mosquito could potentially be spread by Ae. aegypti in an urban cycle (Figure 3). We posit that it is likely that these three dynamic transmission cycles occur currently and that MAYV is likely to be currently misdiagnosed as Dengue virus (or another locally transmitted pathogen) given their close clinical and immunological profiles, as discussed earlier (see “Epidemiology”). Figure 3 Proposed Mayaro virus transmission cycles for northern South America. Dashed boxes represent mosquito vectors for the virus. Mavian C, Rife BD, Dollar JJ, et al. Emergence of recombinant Mayaro virus strains from the Amazon basin. Sci Rep. 2017;7(1):8718. Batista PM, Andreotti R, Almeida PS, et al. Detection of arboviruses of public health interest in free-living New World primates (Sapajus spp. ; Alouatta caraya) captured in Mato Grosso do Sul, Brazil. Rev Soc Bras Med Trop. 2013;46(6):684–690. Talarmin A, Chandler LJ, Kazanji M, et al. Mayaro virus fever in French Guiana: isolation, identification and seroprevalence. Am J Trop Med Hyg. 1998;59(3):452–456. Hoch AL, Peterson NE, LeDuc JW, Pinheiro FP. 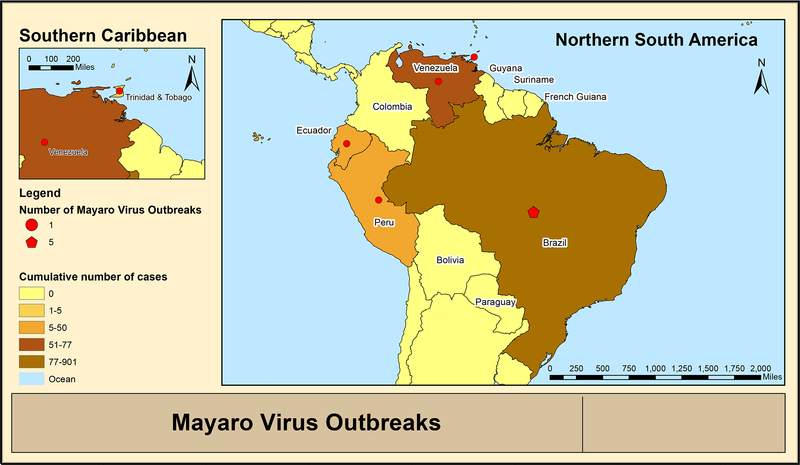 An outbreak of Mayaro virus disease in Belterra, Brazil. III. Entomological and ecological studies. Am J Trop Med Hyg. 1981;30(3):689–698. Mackay IM, Arden KE. Mayaro virus: a forest virus primed for a trip to the city? Microbes Infect. 2016;18(12):724–734. Theilacker C, Held J, Allering L, et al. Prolonged polyarthralgia in a German traveller with Mayaro virus infection without inflammatory correlates. BMC Infect Dis. 2013;13:369. Izurieta RO, Macaluso M, Watts DM, et al. Hunting in the rainforest and Mayaro virus infection: an emerging alphavirus in Ecuador. J Glob Infect Dis. 2011;3(4):317–323. Pinheiro FP, LeDuc JW. Mayaro virus disease. In: Monath TP, editor. The Arboviruses: Epidemiology and Ecology. Vol. 3. Boca Raton, FL: CRC Press; 1988:137–150. Long KC, Ziegler SA, Thangamani S, et al. Experimental transmission of Mayaro virus by Aedes aegypti. Am J Trop Med Hyg. 2011;85(4):750–757. Smith GC, Francy DB. Laboratory studies of a Brazilian strain of Aedes albopictus as a potential vector of Mayaro and Oropuche viruses. J Am Mosq Control Assoc. 1991;7:89–93. Medina G, Garzaro DJ, Barrios M, Auguste AJ, Weaver SC, Pujol FH. Genetic diversity of Venezuelan alphaviruses and circulation of a Venezuelan equine encephalitis virus subtype IAB strain during an interepizootic period. Am J Trop Med Hyg. 2015;93(1):7–10. Navarro JC, Carrera JP, Liria J, Auguste AJ, Weaber SC. Alphaviruses in Latin America and the introduction of Chikungunya virus. In: Ludert J, Pujol F, Arbiza J, editors. Human Virology in Latin America: From Biology to Control. Cham: Springer International Publishing; 2017:169–192. Izurieta RO, Macaluso M, Watts DM, et al. Assessing yellow fever risk in the Ecuadorian Amazon. J Glob Infect Dis. 2009;1(1):7–13. Alva-Urcia C, Aguilar-Luis MA, Palomares-Reyes C, et al. Emerging and reemerging arboviruses: a new threat in Eastern Peru. PLoS One. 2017;12(11):e0187897. Lednicky J, De Rochars VM, Elbadry M, et al. Mayaro virus in child with acute febrile illness, Haiti, 2015. Emerg Infect Dis. 2016;22(11):2000–2002. Esposito DLA, Fonseca BALD. Will Mayaro virus be responsible for the next outbreak of an arthropod-borne virus in Brazil? Braz J Infect Dis. 2017;21(5):540–544. Hassing RJ, Leparc-Goffart I, Blank SN, et al. Imported Mayaro virus infection in the Netherlands. J Infect. 2010;61(4):343–345. Navarrete-Espinosa J, Gómez-Dantés H. [Arbovirus causing hemorrhagic fever at IMSS]. Rev Med Inst Mex Seguro Soc. 2006;44(4):347–353. Moskosky SB. Pregnancy intention—more important than ever. Public Health Rep. 2016;131(5):658–660. Azar SR, Roundy CM, Rossi SL, et al. Differential vector competency of Aedes albopictus populations from the Americas for Zika virus. Am J Trop Med Hyg. 2017;97(2):330–339. Diaz JH. Preparing the United States for Zika virus: pre-emptive vector control and personal protection. Wilderness Environ Med. 2016;27(4):450–457. Martinez D, Murray KO, Reyna M, et al. West Nile virus outbreak in Houston and Harris County, Texas, USA, 2014. Emerg Infect Dis. 2017;23(8):1372–1376. Izurieta R. How well are countries of the Americas dealing with health crises? Latin America Advisor. 2016 Dec 19, p3. Available from: http://www.thedialogue.org/resources/how-well-are-the-americas-dealing-with-health-issues/. Accessed December 7, 2017. Anderson CR, Downs WG, Wattley GH, Ahin NW, Reese AA. Mayaro virus: a new human disease agent. II. Isolation from blood of patients in Trinidad, B.W.I. Am J Trop Med Hyg. 1957;6(6):1012–1016. Casals J, Whitman L. Mayaro virus: a new human disease agent. I. Relationship to other arbor viruses. Am J Trop Med Hyg. 1957;6(6):1004–1011. Lavergne A, de Thoisy B, Lacoste V, et al. Mayaro virus: complete nucleotide sequence and phylogenetic relationships with other alphaviruses. Virus Res. 2006;117(2):283–290. Karbaat J, Jonkers AH, Spence L. Arbovirus infections in Dutch military personnel stationed in Surinam: a preliminary study. Trop Geogr Med. 1964;16:370–376. Azevedo RSS, Silva EVP, Carvalho VL, et al. Mayaro fever virus, Brazilian Amazon. Emerg Infect Dis. 2009;15(11):1830–1832. Terzian ACB, Auguste AJ, Vedovello D, et al. Isolation and characterization of Mayaro virus from a human in Acre, Brazil. Am J Trop Med Hyg. 2015;92(2):401–404. Seymour C, Peralta PH, Montgomery GG. Serologic evidence of natural togavirus infections in Panamanian sloths and other vertebrates. Am J Trop Med Hyg. 1983;32(4):854–861. Auguste AJ, Liria J, Forrester NL, et al. Evolutionary and ecological characterization of Mayaro virus strains isolated during an outbreak, Venezuela, 2010. Emerg Infect Dis. 2015;21(10):1742–1750. Rodríguez-Morales AJ, Paniz-Mondolfi AE, Villamil-Gómez WE, Navarro JC. Mayaro, Oropouche and Venezuelan Equine Encephalitis viruses: following in the footsteps of Zika? Travel Med Infect Dis. 2017;15:72–73. Muñoz M, Navarro JC. [Mayaro: a re-emerging arbovirus in Venezuela and Latin America]. Biomedica. 2012;32(2):286–302. Torres JR, Russell KL, Vasquez C, Tesh RB, Salas R, Watts DM. Family cluster of Mayaro fever, Venezuela. Emerg Infect Dis. 2004;10(7):1304–1306. Pinheiro FP, Travassos da Rosa APA. Arboviral zoonoses of Central and South America. In: Beran GW, editor. Viral Zoonoses. 2nd ed. Boca Raton: CRC Press; 1994:201–225. Llagonne-Barets M, Icard V, Leparc-Goffart I, et al. A case of Mayaro virus infection imported from French Guiana. J Clin Virol. 2016;77:66–68. Receveur MC, Grandadam M, Pistone T, Malvy D. Infection with Mayaro virus in a French traveller returning from the Amazon region, Brazil, January, 2010. Euro Surveill. 2010;15(18):pii=19563. Tappe D, Pérez-Girón JV, Just-Nübling G, et al. Sustained elevated cytokine levels during recovery phase of Mayaro virus infection. Emerg Infect Dis. 2016;22(4):750–752. Friedrich-Jänicke B, Emmerich P, Tappe D, Günther S, Cadar D, Schmidt-Chanasit J. Genome analysis of Mayaro virus imported to Germany from French Guiana. Emerg Infect Dis. 2014;20(7):1255–1257. Slegers CA, Keuter M, Guunther S, Schmidt-Chanasit J, van der Ven AJ, de Mast Q. Persisting arthralgia due to Mayaro virus infection in a traveler from Brazil: is there a risk for attendants to the 2014 FIFA World Cup? J Clin Virol. 2014;60(3):317–319. Neumayr A, Gabriel M, Fritz J, et al. Mayaro virus infection in traveler returning from Amazon Basin, northern Peru. Emerg Infect Dis. 2012;18(4):695–696. Pinheiro FP, Bensabath G, Travassos da Rosa APA, et al. Public health hazards among workers along the Trans-Amazon Highway. J Occup Med. 1977;19(7):490–497. Pinheiro FP, Freitas RB, Travassos da Rosa JF, Gabbay YB, Mello WA, LeDuc JW. An outbreak of Mayaro virus disease in Belterra, Brazil. I. Clinical and virological findings. Am J Trop Med Hyg. 1981;30(3):674–681. Schaeffer M, Gajdusek DC, Lema AB, Eichenwald H. Epidemic jungle fevers among Okinawan colonists in the Bolivian rain forest. I. Epidemiology. Am J Trop Med Hyg. 1981;8(3):372–396. Halsey ES, Siles C, Guevara C, et al. Mayaro virus infection, Amazon Basin region, Peru, 2010–2013. Emerg Infect Dis. 2013;19(11):1839–1842. Strauss JH, Strauss EG. The alphaviruses: gene expression, replication, and evolution. Microbiol Rev. 1994;58(3):491–562. Erratum in Microbiol Rev. 1994;58(4):806. Gould EA, Coutard B, Malet H, et al. Understanding the alphaviruses: recent research on important emerging pathogens and progress towards their control. Antiviral Res. 2010;87(2):111–124. Carvalho CAM, Silva JL, Oliveira AC, Gomes AMO. On the entry of an emerging arbovirus into host cells: Mayaro virus takes the highway to the cytoplasm through fusion with early endosomes and caveolae-derived vesicles. PeerJ. 2017;5:e3245. Tesh RB, Watts DM, Russell KL, et al. Mayaro virus disease: an emerging mosquito-borne zoonosis in tropical South America. Clin Infect Dis. 1999;28(1):67–73. Coimbra TL, Santos CL, Suzuki A, et al. Mayaro virus: imported cases of human infection in São Paulo State, Brazil. Rev Inst Med Trop Sao Paulo. 2007;49(4):221–224. Mourão MPG, Bastos M de S, de Figuereido RP, et al. Mayaro fever in the city of Manaus, Brazil, 2007–2008. Vector Borne Zoonotic Dis. 2012;12(1):42–46. Hotez PJ, Murray KO. Dengue, West Nile virus, chikungunya, Zika—and now Mayaro? PLoS Negl Trop Dis. 2017;11(8):e0005462. Magalhaes T, Foy BD, Marques ETA, Ebel GD, Weger-Lucarelli J. Mosquito-borne and sexual transmission of Zika virus: recent developments and future directions. Virus Res. 2017; pii:S0168-1702(17)30381-7. Epub 2017 Jul 11. Tavares-Neto J, Travassos da Roda APA, Vasconcelos PFC, Costa JML, Travassos da Rosa JFS, Marsden PD. Pesquisa de anitcorpos para arbovírus no soro de residentes no povoado de Corte de Pedra, Valença, Bahia. Mem Inst Oswaldo Cruz. 1986;81(4):351–358. Black FL, Hierholzer WJ, Pinheiro FP, et al. Evidence for persistence of infectious agents in isolated human populations. Am J Epidemiol. 1974;100(3):230–250. LeDuc JW, Pinheiro FP, Travassos da Rosa AP. An outbreak of Mayaro virus disease in Belterra, Brazil. II. Epidemiology. Am J Trop Med Hyg. 1981;30(3):682–688. Saraiva MGG, Amorim RDS, Moura MAS, et al. Historical analysis of the records of sylvan yellow fever in the state of Amazonas, Brazil, from 1996 to 2009. Rev Soc Bras Med Trop. 2013;46(2):223–226. Aitken THG, Anderson CR. Virus transmission studies with Trinidadian mosquitoes. Part II. Further observations. Am J Trop Med Hyg. 1959;8(1):41–45. Heymann DL. Control of Communicable Diseases Manual. 19th ed. Washington, DC: American Public Health Association; 2008. Heymann DL. Control of Communicable Diseases Manual. 20th ed. Washington, DC: American Public Health Association; 2014. Figueiredo LTM. Emergent arboviruses in Brazil. Rev Soc Bras Med Trop. 2007;40(2):224–229. Calisher CH, Gutiérrez E, Maness KS, Lord RD. Isolation of Mayaro virus from a migrating bird captured in Louisiana in 1967. Bull Pan Am Health Organ. 1974;8(3):243–248.